Look at my horse, my horse is amazing. Give it a lick, mmm tastes just like raisins. Come check out my inbred-piano-playing-unicorn! So freakin' awesome. Not what I would do but hey, LOVE the amazing horse vid and this is epic! 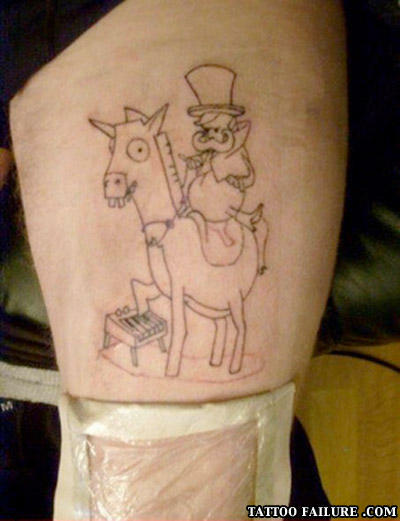 tattoo fail? id call it a win! it tastes just like raisins! ...No, no, no. I think you mean tattoo WIN. Shut up woman git on mah huuuurse..
poor dude's gonna have to keep reminding people what this is. i just watched it and i already forgot. But only in some cases. Mostly never.